I purchased the Frosted Floral DSP a while ago, and I haven’t used any of it yet. Until I created this card, that is. The photo doesn’t show off the pretty shimmer that is on each and every sheet of this gorgeous pack. I discovered that this pack has some colors in common with the Joyous Noel Specialty DSP. Unfortunately that paper is out of stock, and will not become available again. So, I wanted to experiment creating a card with the color palette, but using a different DSP pack. The result is what you see here – what do you think? Since this paper has been so popular, and we are all sad that it isn’t available, Stampin’ Up! has made another paper pack available for purchase. This paper is called “Dashing Along” and was originally a host-exclusive promotion during September. It doesn’t have the sumptuousness of the Joyous Noel DSP, but it features some really pretty patterns in traditional Christmas colors. Please consider that paper when shopping – I’ll include that in the product listing below so you can find it easily. This is the inside of the card, which shows some more of the pretty images in this great stamp set. I love adding a stamped panel for the inside when I’m using dark colors for the card base. It does add a little bit to the weight of the card when mailing, but it makes it much easier to write a greeting. I love the greeting that I used here – what a perfect wish for the season. 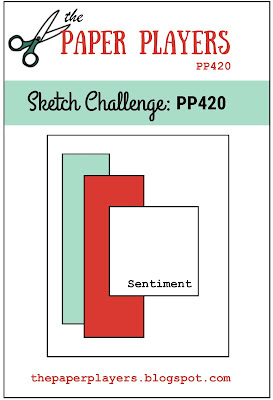 I created this card to participate in the latest challenge from The Paper Players. I must confess that I wasn’t drawn to the sketch at first, but looking at the samples from the designers gave me the inspiration to experiment with beautiful DSP for the vertical strips. Once I noticed that I could use the Frosted Floral DSP to re-create part of the color scheme for the Joyous Noel paper, I was excited to get busy. Edited December 1st – I’m super excited to share that my creation was picked as “A Cut Above” by Anne Marie for the challenge on Paper Players. I’m juiced!!! Andrea, what a beautiful card to showcase that lovely DSP. All of those layers are fabulous! Thanks so much for joining us this week over at The Paper Players. Thank you Anne Marie – your kind words were a lovely start to my day! I look forward to participating in another Paper Players challenge real soon. Andrea… so elegant! I love that you took the time to line each of the focus rectangles… such a lovely effect! Thanks so much for joining us at The Paper Players this week! Thank you so much Elizabeth! I had a lot of fun creating this card, and I’m so glad that you like it. I look forward to future Paper Players challenges.